The 2015 Trek Lush is like the kid who comes back to school after summer break decked out in trendy clothes and sporting a hip new haircut. There was nothing wrong before, but now something stands out. In its fourth year the Lush, Trek's only women's full-suspension bike, has been modernized with 27.5-inch-wheels, a single-ring drivetrain, a dropper post, Trek's new Formula 1-inspired RE:aktiv shock, and, at the highest level, a carbon fiber main frame. On paper, the Lush Carbon ticks off all the boxes. On the dirt, it does too. Mostly. Testers universally favored the SRAM X1 drivetrain, RockShox Reverb dropper and Shimano XT brakes. The Bontrager XR3 Expert tires also earned high praise. The 120-millimeter RE:Aktiv shock is tuned with a higher suspension leverage ratio so lighter riders can set it up with an optimal amount of air pressure. Trek partnered with Penske Racing to develop the shock, which uses a regressive valve that provides firm support while the rider is pedaling, but opens rapidly when the speed cranks up. This, paired with Trek's Dual Rate Control Valve technology, made for a smooth ride through the bumps and an efficient one on the climbs. 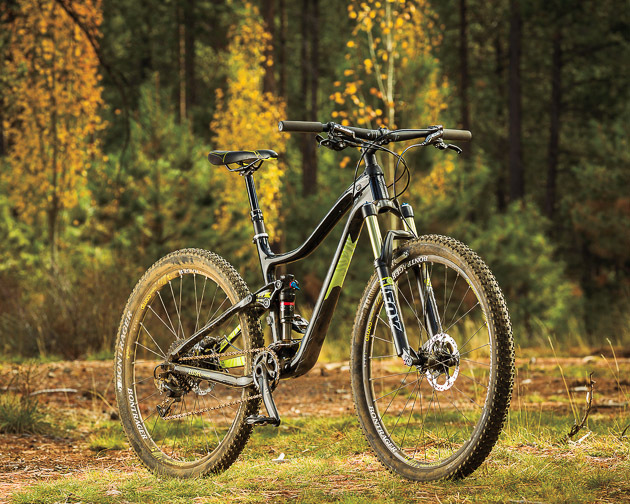 The bike devoured the succession of 2-to 3-foot rock drops on our test run and felt predictable in the air, but it also climbed like a pure XC machine–fast, stiff, light and responsive. The superb ride quality in the rear, though, tended to overshadow the front end. The 120-mil Fox Evolution 32 Float fork is an appropriate choice, but testers noted that it felt underwhelming, especially in technical sections. The lack of confidence could also be attributed to the stock cockpit. At 660 millimeters wide, the Bontrager Race Lite bar is quite narrow, and the solution to improving handling could be as simple as swapping the bar and stem. As with all Trek bikes, the size range is broad–women's bikes measure from 14 inches to 18.5 inches–and fit can be different than conventional S, M, L frames. Two testers who typically ride a size medium, for example, felt cramped on the 17-inch test bike. We had questions about the new bikes before we even got our test rigs, so we sent out a few queries—the kind of things we thought you might be asking yourself when you're looking at this bike. Then we sent out another round of asks if any major questions or issues came up during testing. Here's the feedback we received from Trek assistant mountain bike brand manager, Ross Rushin. VERNON FELTON: I noticed that the Lush was placed in both the XC (cross country) and Trail category on the Trek website. I always thought of this as a dyed-in-the-wool trail bike—it's a pretty damn capable rig. Who do you think is the ideal rider (or what are the ideal conditions) for the Lush? ROSS RUSHIN: The main focus of the Lush is squarely on trail riders, but we do include it in our XC category because it really is a do-it-all kind of bike, and many who consider themselves “XC” riders still want the confidence-inspiring benefits of a full-suspension bike built with female riders in mind. Besides, "XC" can be a subjective term. British Columbia "XC" can be pretty technical. As you’ve already mentioned, it is a damn capable rig, and it really shines when the trail starts to venture out of “XC” territory and gets more technical. VF: What—from a fundamental design standpoint—actually makes the Lush as capable as it is? RR: Lush has a slightly higher leverage ratio. Why is that good for a women's specific bike? Shocks have an air pressure range they perform best in. Women, on average, are lighter than men so optimizing the rear suspension for a woman's bike means tuning the leverage ratio so that the suspension works ideally for all the potential Lush riders. A slightly higher leverage ratio makes the suspension a bit more active, boosting rider confidence over the rough stuff. On top of that, our WSD geometry helps female riders achieve a more ideal weight distribution and gives her more control over the front end, rather than hanging off the back. VF: The women's-specific Lush models all rock the 27.5 wheel size whereas the men's Fuel EX is available with both 27.5 or 29er wheels. Was the thinking here that a women's-specific bike should sport a smaller frame and that the smaller wheel size best accommodates that? RR: Our decision to use 27.5 wheels on the Lush was largely based on rider feedback, our own wheel size testing, and current state of the women's market. On average, women are smaller than men, and, as a whole, prefer the smaller 27.5-inch wheels. A 27.5 wheel gives these riders some of the bigger-wheel benefits, but is easier to control than a 29er wheel. Furthermore, it is indeed easier to fit a smaller rider to a smaller wheel. Of course, for those women who prefer a 29-inch wheel, we have the Fuel EX 29.